Bangalore Tourist Guide - City..
Kabini Ultimate Tourist Guide -..
Hampi Tourist Guide – Best..
Mysore Tourist guide – Visit..
Karnataka State is one of the most beautiful states in india, It is Located in the southwestern part of India, the state of Karnataka has its own unique flavour, which attracts travelers & tourists from all around the globe. Holiday Travel India Pvt Ltd is offering Karnataka Heritage tour which covers best Archeological Heritage Sites. Karnataka is a place of million stories that are told through its forts, palaces, and ancient towns. Through the Karnataka Heritage Tour Package tourists will be exposed to ancient Indian art, architecture and craftsmanship of the Hoysalas, Cholas, Chalukyas, etc. In this special heritage package you will cover all world famous Heritage destinations of Karnataka, Including Mysore, Hassan, Hospet, Hampi, Badami , Belgaum, also famous temples of Karnataka. What is unique about package and why? Mysore city is worldwide famous for its finest palaces, Royal heritage and magnificent buildings. Palaces of Mysore are designed by an English Architect. Henry Irwin is an architectural marvel featuring marvelously sculpted pillars, elaborately carved doors and golden howdah. In the olden days Mysore was known for its ivory handicrafts, paintings, silk garments, rosewood inlay work. The artifacts are made out of sandalwood, rosewood and teakwood. Hassan is famous for jain pilgrimage spot where most of the temples and Historical places found to visit. Hasanamba Temple is prime attraction in Hassan which is open to the public for a week annually during the lunar month of Ashwayuja, during deepavali in October. The devotees believe that the benevolent Goddess smiles down upon them and showers her blessings. Badami is very famous destination of Karnataka which is generally known for its artificial lake, ancient temples, museum and rock cut structural temples or cave temple. But apart from these it is mostly known for cave temples. Cave temples are carved out of single sandstone rock with exquisite carvings on the top of the hill as early as 550 AD. These cave temples follow a set pattern like a verandah with pillars, a hall with columns and a small cell to enshrine the deity. Belgaum is known as bamboo village which is one of a few ancient cities, which has preserved its natural beauty as well as its historical places. This city has the cultural flavor of Maharashtra, Karnataka and Goa. It is a blend of these three cultures which has created the rich heritage that is purely exclusive in its expression. Discover the rich heritage of Karnataka & UNESCO World Heritage sites like Hampi. Visit most famous forts, monuments and Historical places. Lunch: served at Hotel Niyaaz which provides all type of cuisines with delicious taste. By Flight: Bangalore is one of the famous metro city which is conncted with all metro city. International & Domestic routes are available. Bangalore International Airport which is located at a distance of 40 km from the city center, Flights to Bangalore are available from all major and minor cities in India. By Train: Bangalore railway station is located in the heart of the city. Various trains from all over India come to Bangalore. Mysore is a major city of Karnataka. Mysore has a rich and vibrant history and heritage and hence attracts a huge number of tourists. The city is at 770m above sea level and 140kms from Bangalore, the state capital. Mysore has an area of 6,268 sq km and a population of 22,81,653 (1991 census). The city is at 770m above sea level and 140kms from Bangalore, the state capital. Mysore has an area of 6,268 sq km and a population of 22, 81,653 (1991 census). Mysore is very famous city known for its heritage sightseeings and Gardens. There is most of the places lie in Mysore which is very famous to visit and expand your holiday, there are more things to do in Mysore which is mentioned below. 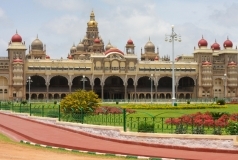 Mysore Palace: is a palace situated in the city. It was the official residence of the former royal family of Mysore, and also housed the durbar (royal offices).The term "Palace of Mysore" specifically refers to one of these palaces, Amba Vilas. Lalitha Mahal: is the second largest palace in Mysore. It is located near the Chamundi Hills, east of the city. The architect of this palace was Mr E W Fritchley. The palace was built by Krishnaraja Wodeyar IV in 1921 for the exclusive stay of the Viceroy of India. The palace is pure white in colour and is built in the style of Italian palazzo with twin Ionic columns and domes. It also has a sprawling terrace and landscaped gardens. Jaganmohan Palace: was built in 1861 by Krishnaraja Wodeyar III in a predominantly Hindu style to serve as an alternate palace for the royal family. This palace housed the royal family when the older Mysore Palace was burnt down by a fire. The palace has three floors and has stained glass shutters and ventilators. It has housed the Sri Jayachamarajendra Art Gallery since the year 1915. The collections exhibited here include paintings from the famed Travancore ruler, Raja Ravi Varma, the Russian painter Svetoslav Roerich and many paintings of the Mysore painting style. Jayalakshmi Vilas Mansion: This palace was built in 1905 by Chamaraja Wodeyar for his eldest daughter Jayalakshmi Devi. This mansion has three wings and contains a series of twin Corinthian and Ionic columns, regal pediments and oval ventilators. The mansion was originally built with a cost of Rs. 7 lakhs. This mansion was acquired by the Mysore University to house its post-graduate campus. It was renovated in 2002 from funding provided by Infosys foundation. The main hall in this mansion is the Kalyana Mantapa which has an eight-petal shaped dome with stained glass windows with a gold-plated Kalasha(tower) at the top. A new gallery called as Writer's Gallery has been created in the Kalyana Mantapa hall that will exhibit personal items, photographs, awards and writings of renowned writers of Kannada. A special illumination system has also been added to this heritage structure. This mansion is said to be the first university museum complex in the country. Brindavan Gardens is a show garden that has a beautiful botanical park, full of exciting fountains, as well as boat rides beneath the dam. Diwans of Mysore planned and built the gardens in connection with the construction of the dam. Display items include a musical fountain. Various biological research departments are housed here. There is a guest house for tourists. It is situated at Krishna Raja Sagara (KRS) dam. Shantaleswara Temple: Hoysaleswara temple is a temple dedicated to the Hindu god Shiva. Established next to each other and facing east. It is built out of soft Soapstone, also called as potstone. Shravanabelagola: Shravanabelagola is a city located near Channarayapatna of Hassan district in the Indian state of Karnataka and is 158 km from Bangalore, the capital of the state. Shravanabelagola is a historical temple town and pilgrimage centre in Karnataka, located in South India. This small town boasts of the largest number of Digambara temples as well as the largest number of inscriptions in the country.The cynosure of the centuries, Gommateshwara towers in his 57 feet solitary serene splendour, over the surrounding countryside. Kedareswara Temple: Kedareshwara Temple is a Hoysala era construction in the historically important town of Halebidu, in the Hassan district of Karnataka state, India. It is located a short distance away from the famous Hoysaleswara Temple. A Chalukyan manner temple with two Hoysala emblems is very renowned where the sculptor’s talent has persuaded even the goldsmith’s skill. The beautiful mix of architecture is so profound that it can overwhelm anybody. Hoysaleswara Temple: Hoysaleswara temple is a temple dedicated to the Hindu god Shiva. It was built in Halebidu. This place attracts visitors from all part of the world for the famous Hoysaleswara and Kedareshwara temples. Hoysaleshwara temple has the deities of Lord Hoysaleswara aThe art of Hoysaleswara temple was the creation of a commander in the Kind Vishnuvardhana's kingdom called Ketamalla.nd Lord Shantaleshwara. Veeranarayana Temple: The Veera Narayana temple is located in Belavadi, a village in the Chikkamagaluru district of Karnataka state, India. The temple was built during the rule of the Hoysala Empire, Known to legend as Ekachakranagara. The temple is exquisitely crafted and is one of the architectural marvels of India. The temple is a ‘trikuta’ (possessing 3 towers) with Sri Veera Narayana in the center facing east, Sri Venugopala facing north and Sri Yoganarasimha facing south. It is built out of soft Soapstone, also called as potstone. Hampi is a village in northern Karnataka state, India. It is located within the ruins of Vijayanagara, the former capital of the Vijayanagara Empire. Predating the city of Vijayanagara, it continues to be an important religious centre, housing the Virupaksha Temple, as well as several other monuments belonging to the old city. Hampi has distinction of being a UNESCO World Heritage Site for old Vijayanagara city, the former capital of the Vijayanagara Empire. Hampi is situated on the banks of the Tungabhadra river at 353 km from Bangalore and 74 km away from Bellary. Hosapete (Hospet), 13 km away, is the nearest railway head. Hampi is famous for the annual Vijayanagar Festival is organized by the Government of Karnataka in November in every year. Hampi is situated on the southern bank of the river Tungabhadra. Once it was the seat of the mighty Vijayanagara Empire. Hampi has hundreds of monuments and other attractions fabulously rich princes built Dravidian temples and palaces which won the admiration of travelers between the 14th and 16th centuries. Conquered by the Deccan Muslim confederacy in 1565, the city was pillaged over a period of six months before being abandoned. The sophistication of the varied urban, royal and sacred systems is evident from the more than 1600 surviving remains that include forts, riverside features, royal and sacred complexes, temples, shrines, pillared halls, Mandapas, memorial structures, gateways, defense check posts, stables, water structures, etc. Among these, the Krishna temple complex, Narasimha, Ganesa, Hemakuta group of temples, Achyutaraya temple complex, Vitthala temple complex, Pattabhirama temple complex, Lotus Mahal complex, can be highlighted. It has famous and well visited monuments which includes Achyutaraya Temple, Lotus Mahal, underground shiva temple, Monolith Bull, Pushkarni and much more. Hampi is a village in northern Karnataka state, India. It is located within the ruins of Vijayanagara, the former capital of the Vijayanagara Empire. The temprature of Hampi Best time to visit Hampi is from August to March. The weather during this time stays pleasant and makes it easy for the travelers to explore Hampi, in winter temprature becam 15°C-34°C. The distance between Hampi to Badami is approx 147km away from each other from by road and id you travel with aerial then it is became 107km. It takes 2.5 Hours to reach from Hampi to Badami. When it comes to the important world heritage sites in India, the ruins of Hampi hold the top position in the prestigious list. There are several temples you can see like the Virupaksha temple, the Achyutaraya temple and the Laxmi Narasimha temple. The magnificent world heritage sites at Hampi and Pattadakkal, the cave temples of Badami the exquisite temples at Aihole and the stately Forts, Domes and minarets of Bijapur resurrect the state's history and cultural affluence. Badami or Vatapi as it was earlier known as, it is one of the most treasured monuments of ancient India. The paintings which are housed in rock-cut cave temples mostly belong to 6th and 8th centuries. The Badami caves were a major source of inspiration to the monuments at Mahabalipuram. These caves presents the perfect blend of the architectural design of the north India Nagara style and the south India Nagara. Description of caves of Badami : There are total of four Badami caves. Out of which three are the Brahminical caves and one is the Jain cave. Cave I is dedicated to Lord Shiva, Cave II and III to Lord Vishnu and cave IV to the Jain saints. Badami, formerly known as Vatapi, is a town and headquarters of a taluk by the same name, in the Bagalkot district of Karnataka, India. Badami has been selected as one of the heritage cities for HRIDAY. There are lot more places to visit in Badami as well as nearby to Badami which includes. Belgaum Fort: Belagavi Fort or Belgaum Fort, is located in the city of Belagavi, in the Belagavi district, in Karnataka state, India. It was begun by Jaya Raya, also called Bichi Raja, an ally of the Ratta Dynasty, in the year 1204 AD. It has a rich history with several historical and religious monuments dated to the Adil Shahi dynasty. The Belgaum fort is a major tourist attraction in Belgaum. Belgaum was ruled by a number of dynasties and as such the fort has undergone many additions and renovations throughout its existence. Mahadev Temple: Military Mahadev Temple is located in Belgaum, Karnataka. The temple and the park around it have become popular destinations for locals as well as visitors. Kapileshwara Temple: Kapileshwar Temple in the Belgaum district is considered the oldest temple in India. The temple is believed to be the oldest of all the Kapileshwar temples. The temple is even famous as "Dakshina Kashi" and it is said that the “journey of the 12 Jyotirlingas of India is said to be incomplete without a visit to Kapileshwara” Kapileshwara Temple is said to have self originated. You will also find smaller shrines dedicated to Lord Ganesha, Sri Sai Baba, Hanuman, Lord Dattatreya and a small temple dedicated to Navagraha (the nine planets) in the same compound. Right in the center of the courtyard, the statue of Lord Shiva rests in a tiny pond. Parasgad Fort: Parasgad Fort is a ruined hill fort in the Belgaum district of Karnataka state, India. magnificent fort of Parashghad, dating back to the 10th century and built by famous rulers of Ratta dynasty Parasgad Fort is located about two kilometres south of Saundatti village. Karnataka is very famous city known as heritage, Historical places, monuments, temples and religious sites. The state is fifth most popular place in India for tourism and home to 3600 protected monuments in India, ancient sculptured temples, World heritage centers and impressively architecture. There are more interesting points to visit and enjoy heritage sites of Karnataka.